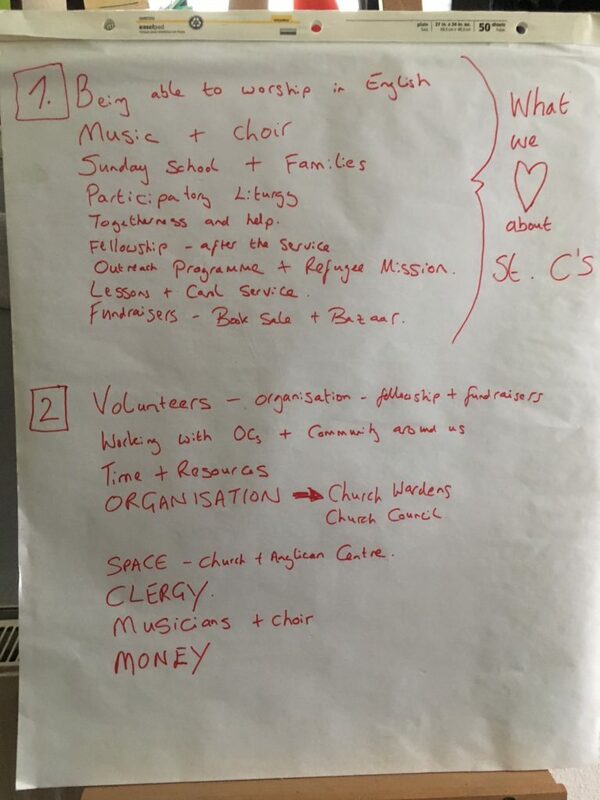 We asked the congregation two questions, “What are the things you like best about St. Catherine’s?“ and “What is needed to make these things happen?“, and you came up with lots of answers! To see what answers we collected, look at the photo of the flip-chart. As „homework“, we asked you to think about your favourite ways of supporting St. Catherine’s. We need space to worship in. We need clergy people to lead us in our devotions. We need lots of volunteers, to organize church life, to make music, to help with services, fellowship and fundraisers. Last but not least, we need money. What do you think it costs per day to keep the community life of St. Catherine’s going at its current level? What do you think are the three biggest bills that St. Catherine’s has to pay every year? Bible study will begin again on Wednesday 26 September at 7.30pm at the Anglican Centre, Olgastraße 56, 70182 Stuttgart. Will meet on Monday 15th October – 19:00 at Injeera Please e-mail legs@stcatherines-stuttgart.de if you would like to join us. we give thanks for Kara’s ministry in Stuttgart and pray that she will return refreshed from her holidays. As we are still enjoying sunshine in Germany, there are many parts of the world suffering under too much water: we pray for those in the Philippines, Nigeria, the east coast of the US and India suffering the effects of flooding and storm surges.